Added support for the COOLPIX B500 and A300. Added support for MP4 movies. Added ranges to the sliders in the Adjustments/Metadata palette. The sliders in the Adjustments/Metadata palette can now be reset by clicking the mark that indicates the default position. Added a View menu to Preferences for a custom grid display. Added perspective control to the Straighten tool. Sliders now show increments at all times. Fixed an issue that caused blurring when Noise Reduction > Better Quality 2013 was applied to NEF (RAW) photos taken with the D610. 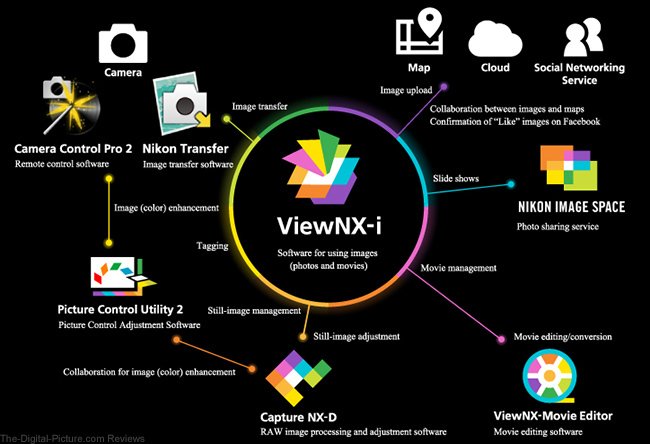 Nikon's new image browsing software – ViewNX-i – is now available for download. Support for the D5500, COOLPIX S3700, S2900, L32, and L31 has been added. Support for the S6900 has been added. Nikon has added D750 support to View NX 2, Capture NX-D and Picture Utility Control 2. See below for update links. B&H has the Nikon D750 available for preorder. Nikon has updated ViewNX and Capture NX for compatibility with the D5300 and Df cameras. More detail below. Support for the D5300 and the Df has been added. Support for RAW images captured with the D5300 and the Df has been added. - Movies added to the storyboard must have been recorded at a frame rate of 50p or 60p, and they must be originals (unedited by any movie editing software). - File type must be set to a type other than MOV (MotionJPEG/Linear PCM). Support for the COOLPIX L620 has been added. GeoTag in the toolbar has been changed to Map. In addition, GPS data and GPS information have been renamed Location data. When Short Movie Creator or Movie Editor is selected from the Open With... option in the File menu, users can now choose Movies (MOV) and JPEG images or Movies (MOV). However, to choose one of the above, Short Movie Creator or Movie Editor must be registered in Open With > Register... > Open with Application beforehand. A Merge Altitude Log with Track Log... option has been added to the Log Matching item. A location log saved with a camera, mobile phone, or other commercially available satellite navigation system receiver capable of acquiring location data can now be merged with an altitude (barometer) and depth log* saved using a Nikon digital camera. Altitude (barometer) and depth logs are recorded by Nikon digital cameras equipped with barometers or depth gauges. Frame rate options of 50 fps and 60 fps are now available for movies created using the Create Movie... item in the Nikon Movie Editor File menu and output at a size of 1280 x 720 (16:9) and 1920 x 1080 (16:9). However, the following two requirements apply when 50 fps or 60 fps is selected for Frame rate:. This software is offered to those who have purchased Capture NX 2. When this software is run, it may be necessary to enter the product key again to confirm ownership of a previous version of the software. When this software is installed on a computer to which ViewNX 2 Ver. 2.2.3 or earlier has been installed, the Picture Control Utility cannot be launched from ViewNX 2. Please upgrade ViewNX 2 to Ver. 2.2.4 or later. RAW images saved with Thumbnail only selected for Embed Preview When Saving NEF/NRW in Capture NX 2 Preferences will appear grainy with display in and printing from ViewNX 2. If either Capture NX 2 or the Picture Control Utility (one or the other) is launched in 32-bit mode on a Macintosh computer, Capture NX 2 may freeze unexpectedly if Save as a new Custom Picture Control or Load Custom Picture Control Settings is selected from the Manage Picture Control menu in Capture NX 2. To use the software in 32-bit mode, be sure that both Capture NX 2 and the Picture Control Utility are running in 32-bit mode. ViewNX 2 is an all-in-one image browsing and editing software application for both still images and movies. Nikon Transfer 2 is incorporated into ViewNX 2 for transferring images to a computer. Smoother collaboration with NIKON IMAGE SPACE, Nikon's image storage and sharing service, has also been achieved. This is the full version of ViewNX 2.7.6 for Windows and Macintosh computers. If you are currently using ViewNX 2 this download will uninstall your existing version and then install version 2.7.6. This software supports all Nikon D-SLR cameras, Nikon 1, and all COOLPIX cameras with USB support.. The 64-bit version of ViewNX 2 Ver. 2.7.6 can be used with the following operating systems. The 32-bit version of ViewNX 2 Ver. 2.7.6 can be used with the following operating systems. Only the 32-bit version will run under a 32-bit operating system. - Image transfer using Nikon Transfer 2 is not possible with the following cameras. Use a card reader to transfer images to a computer for storage. - Image transfer using Nikon Transfer 2 with the camera connected to the computer is not possible with the cameras indicated below. Use a card reader to transfer images. 1. Movies up to 60 minutes in length can be edited with the Windows version; movies up to 30 minutes in length can be edited with the Macintosh version. 2. The following restrictions on the number of movies and still images that can be added to the storyboard apply. - A project containing up to 10 movies, or a total of 30 movies and still images, can be previewed and exported. - When a movie a few seconds in length with transition effects applied is added to the storyboard, the movie file may not be properly exported, even if it does not exceed restrictions on the number of movies and still images. - A project containing 4 H.264 (1920 × 1080) movies and 2 still images can be previewed and exported. However, when H.264 movies recorded at 720p and lower are used, the number of movie files and still images that can be used in a project increases. - In addition, when only Motion JPEG (1080p) movies are used, a project containing up to 30 movies can be previewed and exported. 3. Movies recorded at a setting of 1080/60i are handled as 1080/30p movies. When images captured at a white balance setting of Auto and an image quality setting of NRW (RAW) are enhanced using ViewNX 2, the results achieved may differ from those achieved with in-camera NRW (RAW) processing. Ratings applied with a COOLPIX camera in playback mode are not reflected in ViewNX 2 or other applications that support ratings. Colours will appear lighter in movies played back on a computer running Macintosh. MPO-format images shot in 3D can only be viewed with a viewer that supports 3D images. Scene mode information is not correctly displayed in the Metadata palette for images captured in Smile mode. However, all other operations function properly. - When this software is installed on a computer to which Capture NX 2 Ver. 2.2.8 or earlier has been installed, the Picture Control Utility will be replaced with a version not supported by Capture NX 2, making it impossible to launch the Picture Control Utility from Capture NX 2. Please upgrade Capture NX 2 to Ver. 2.3.0 or later. - RAW images saved with Thumbnail only selected for Embed Preview When Saving NEF/NRW in Capture NX 2 Ver. 2.3.0 or later Preferences will appear grainy with display in and printing from ViewNX 2. When this software is installed on a computer to which Capture NX has been installed, the Picture Control Utility will be replaced with a version not supported by Capture NX, making it impossible to launch the Picture Control Utility from Capture NX. In some rare cases, depending upon the system to which QuickTime Ver. 7.7 is installed, the following features may not function. Camera date and time will not be synchronized with the computer’s, even when Synchronize camera date and time to computer when camera is connected (supported cameras only) in the Nikon Transfer 2 Preferences panel is checked, when Calendar is set to any option other than Gregorian in the Language & Text>Formats panel of the computer’s System Preferences. Nikon has released Capture NX 2.4.2 and ViewNX 2.7.5 software updates – both were updated with the modification listed below. When RAW images captured with a D600 running C firmware Ver. 1.01 at an Image area setting of DX (24×16) 1.5x and any Active D-Lighting setting other than Off were opened in Capture NX 2, a bright (whitish) diagonal line was visible. This issue has been resolved. B&H carries Nikon Capture NX 2 photo editing software. NEF Codec is a module that makes Nikon RAW (.NEF) image files as easy to work with as JPEG and TIFF images. Supports NEF (RAW) images taken with the D7100, COOLPIX A.